The beautiful new Aqua Mizer by CWE responsive website with accompanying product demo video helps CWE promote its distribution of improved flush systems to multi-tenant properties on behalf of Aqua Mizer. Visit the Aqua Mizer by CWE website. View the Aqua Mizer by CWE demo video. Commercial Water & Energy (CWE) had begun its relationship with DDA with the redesign and redevelopment of its website in 2013. DDA has also designed trade show graphics for CWE. When CWE acquired exclusive rights to distribute the patented Aqua Mizer system to multi-tenant properties, they came to DDA to design a new website to promote the benefits and financing options of the system to that market. The Aqua Mizer flush prevents water damage to properties and slow leaks, increases per-flush water efficiency, and reduces clogs, all saving substantial time and money. The website would need to convey the unique benefits of the flush system, explain how its works, and demonstrate the substantial value of upgrading multi-tenant toilets with it. The website would feature the vibrant colors and branding found in the original CWE website, but presented in a responsive website design to optimize end-user experience on all computers and mobile devices and ensure the best possible ranking on search engines. The website would feature a new product explainer video that would effectively demonstrate how the mechanics of the Aqua Mizer flush work to manifest its benefits, succeeding where previous product videos had failed. Content woud explain the cost and environmental benefits, the financing options, testimonials from clients, brief case studies, and contact tools to capture new potential customers. DDA worked with the existing CWE logo and used its chartreuse-and-cyan color scheme to frame the new responsive website design. Wave motifs are used throughout, reflecting the water utility side of CWE's business. The homepage presentation features a series of four sliding banner images with text communicating the problem with current flush systems, the threat of catastrophic flushing they propose, the solution found in the Aqua Mizer flush system, and the resulting improvements realized upon installing the Aqua Mizer Solution. Scrolling down the page offers additional supporting information on the Aqua Mizer flush system, with large colorful imagery powerfully illustrating the concepts. The homepage also includes a cost savings calculator that gives owners of multi-tenant properties a rough idea of their expected water bill savings based on their overall water usage and the number of toilets maintained on their properties. First-time visitors are automatically presented with the Aqua Mizer product explainer video, which shows two clear toilet tanks using a traditional flush and the Aqua Mizer system side by side to demonstrate the mechanism of the flush and how it reacts to leaking conditions. The video is punctuated with still screens that detail the problems addressed by the Aqua Mizer flush system, the solution it presents, and the benefits of installation. On-screen texts provide further explanation of the mechanics and advantages of the Aqua Mizer system over traditional toilet flush systems. First-time visitors are then presented with a pop-up window that gives them the opportunity to contact CWE right away for additional information to encourage lead acquisition. The top menu bar allows for effortless navigation throughout the website. Pages (two of which were written by DDA's professional writers) are devoted to the environmental and cost benefits of the Aqua Mizer flush system, testimonials and case studies from successful installations, introduction to CWE, an explanation of purchase options (including financing from water savings with zero initial capital outlay), a detailed How It Works page, and a contact form that inputs lead contact information directly into CWE's Salesforce account. Certifications and a warranty are included for reference. The video can also be accessed from the top menu at any time. DDA also designed a trade show display to match the design of the new website. 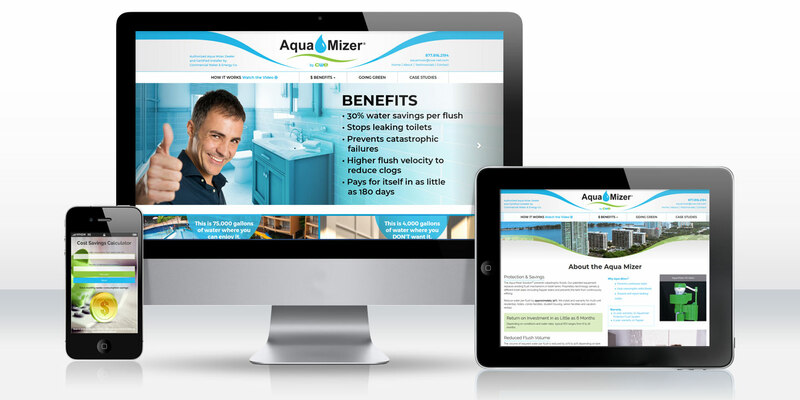 The final website, with its clean, spacious responsive web design, bold colors, lively imagery, succinct product explainer video, and helpful cost calculation and contact features, puts the Aqua Mizer flush system in its best light. The website and video clearly communicate the incredible value offered to multi-tenant property owners by the Aqua Mizer system, encouraging potential leads to become new customers of CWE. The video and website were warmly received, and the trade show graphic based upon the site design won best booth at the trade show among the 100+ booths featured there: "It came out great."